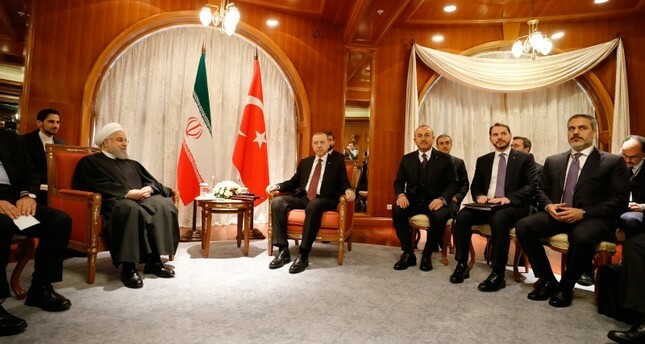 President Recep Tayyip Erdoğan met with his Iranian counterpart Hassan Rouhani and Russian counterpart Vladimir Putin in the Russian Black Sea port city of Sochi on Thursday ahead of a trilateral summit on Syria. Foreign Minister Mevlüt Çavuşoğlu, Treasury and Finance Minister Berat Albayrak, Defense Minister Hulusi Akar, Presidential Communications Director Fahrettin Altun, National Intelligence Organization (MIT) chief Hakan Fidan, Presidency of Defense Industry (SSB) head Ismail Demir and Presidential Spokesperson Ibrahim Kalın accompanied Erdoğan in the meetings. Prior to the meeting with Putin, Erdoğan said that in order to protect Syria's territorial integrity, the People's Protection Units (YPG), the armed wing of PKK terrorist group's Syrian offshoot Democratic Union Party (PYD), must be swept away from areas where it persists near the Turkish border. "Syria's territorial integrity will not be ensured unless the PYD/YPG terror group is cleared away from Manbij, (and) east of the Euphrates," Erdoğan told before the Russian delegation in the beginning section of the process open to the press. In its more than 30-year terror campaign against Turkey, the PKK -- recognized as a terror group by Turkey, the U.S. and the EU -- has been responsible for the deaths of some 40,000 people, including women and children. Turkey promised a counter-terrorist operation against the PYD/PYG in Syria, following two similar successful operations since 2016. Erdoğan also said Turkey welcomes Russia's positive attitude towards a proposed safe zone in northern Syria, adding that Turkey also supports the idea as long as it serves to address Turkey's national security concerns. "It is very important that the cooperation which took place regarding the use of airspace in Idlib also takes place in Afrin and the area [liberated by] Operation Euphrates Shield -- one of the previous counter-terror operations --," Erdoğan added. The president said Turkey put intensive effort to solve the problem related to the radical groups in Idlib, northwestern Syria. "We are pleased that our military officials have reached an agreement over joint patrols in the area," Erdoğan said. He added that Turkey did not spot any elements with heavy weapons during its drone-backed search over the demilitarized zone. After a meeting in Sochi last September between Erdogan and Putin, the two sides agreed to set up a demilitarized zone -- in which acts of aggression are expressly prohibited -- in Idlib. But according to the Syrian White Helmets civil defense group, at least 30 people in Idlib were killed in January, including women and children, while another 180 were injured -- in Idlib, Hama and Latakia -- by regime drone attacks and artillery fire. Last month also saw the regime targeting Idlib's southeastern countryside, along with rural parts of the Aleppo, Latakia and Hama provinces. The leaders of Turkey, Russia and Iran, known as the guarantor states of the Astana peace process named after the Kazakh capital where efforts to find a lasting solution in Syria were first launched, will later convene for their fourth leaders' summit. The situation around the de-escalation zone around the northern Syrian province of Idlib and the pending withdrawal of U.S. troops from the war-torn country are among the topics which were expected to be discussed. The three presidents are also expected to exchange opinions on the joint fight against terrorism in the region, restoring calm to Syria, stabilizing the country and returning the displaced Syrians. The three leaders will hold a joint press conference in the summit's aftermath, which will be followed by a working dinner. The leaders first met to discuss Syria in Sochi in 2017 and the last summit was held in the Iranian capital Tehran in September. Turkey, Russia, and Iran brokered a cease-fire in Syria in December 2016, leading to the Astana talks, which are running parallel to the Geneva talks brokered by the U.N. and involving Western powers. Before leaving for Sochi, Rouhani told reporters at Tehran's Mehrabad International Airport that some oil-rich countries in the region support terrorism. "The U.S. and Israel are the paths for terrorism in our region," Rouhani said. "Unfortunately, some oil-rich countries in the region support these terrorists." On the U.S.' military withdrawal from Syria, he said it was good news if true, arguing that the U.S. "occupying force" being in the country violates international agreements.